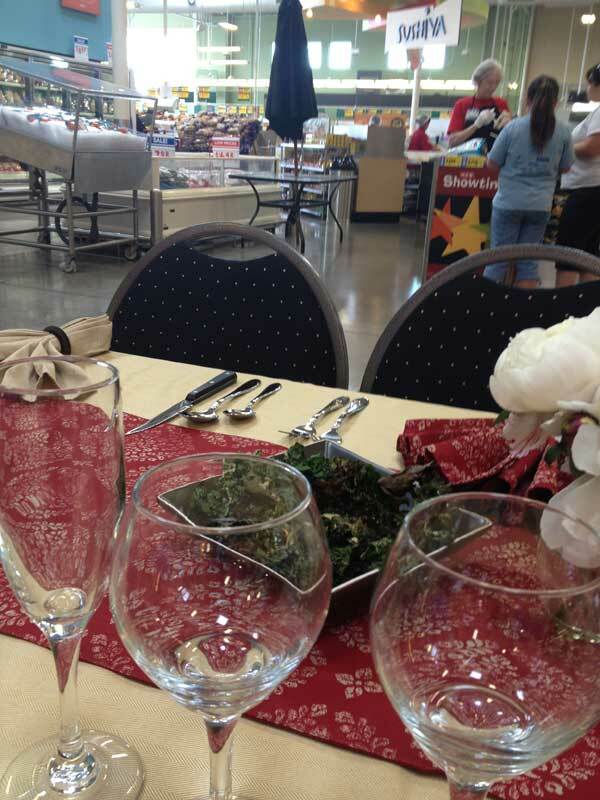 This weekend I had lunch at my grocery store, the H-E-B. Hosted by H-E-B’s popular Cooking Connection, an area where in-store chefs demonstrate recipes using select products, the event was to promote the Cooking Connection’s expansion into classes. For instance, the Brodie Lane H.E.B. is now scheduling tastings that involve more food, more wine, and more chef interaction. The next one is July 19 at 6:30 PM, and I’m trying to get the word out because it’s a real labor of love for H.E.B.’s chefs. If you’re in town and like activities with chef involvement and a little education on the side, call the Brodie H-E-B, ask for ext. 234 and sign up. You’ll get a lot of food and wine for a very small price ($25 for 5 full courses). And as Jodie from Tasty Touring mentioned, it would be a fun date night activity. Our seating was an early lunch, and for this we were served Kale Chips, Green Chile Breakfast Strata, Steelhead Trout with Lemon Caper Dill Sauce, Pineapple Cucumber Gazpacho, Herb Roasted Lamb Chops and Sticky Toffee Phyllo Cups. Each course was served with a different wine, and as we tasted each pairing we were given insight into new products. One of my favorites was Coombe Castle Sticky Toffee Cheese. 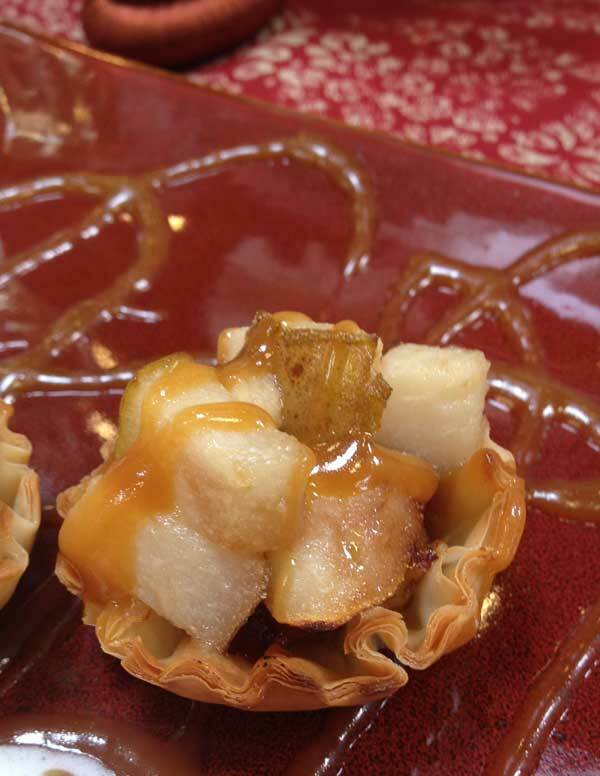 And another big standout was the Green Valley Ranch Reserve Caramel Sauce with Agave. 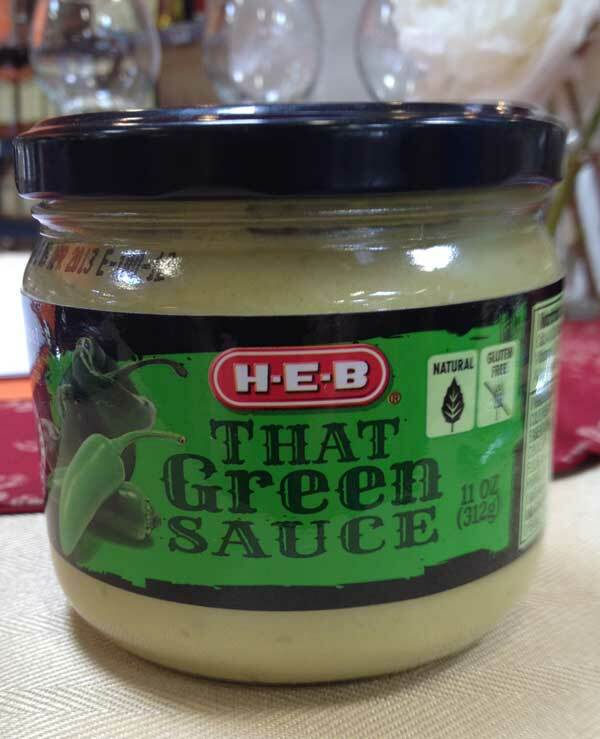 We were also introduced to Cookwell Green Chili Stew, Robert’s Reserve Lemon Dill Caper Sauce and H-E-B’s That Green Sauce, which is becoming somewhat of a legend around here, and might be worth picking up as a souvenir if you pass through an H-E-B. But back to that sticky toffee cheese. 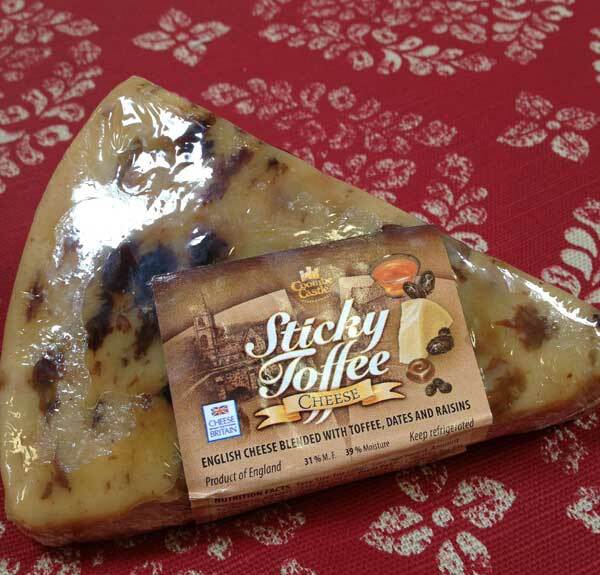 Have you ever tried sticky toffee cheese, and if so, what did you think? It was a first for me, and I will say that it was “different” and not in a bad way, because each time I tasted it I wanted more. It was an interesting addition to the phyllo dessert, but if you can’t find it, try a dollop of plain cream cheese sprinkled with cinnamon. 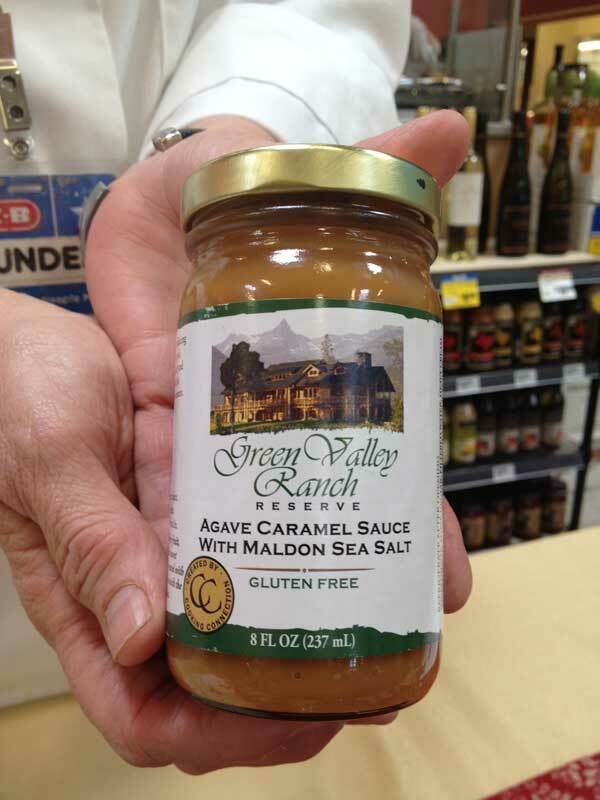 As for the caramel sauce, again — you can use any type you want, but if you can find the Green Valley Ranch Reserve, it’s good stuff! Melt the butter in a skillet set over medium heat. Saute pears in the butter until soft. Place shells on baking sheet and bake for 3 minutes. When just out of the oven, put a cube of cheese in bottom of the cup. Place a tablespoon of pears on the cheese and bake for 2 to 3 minutes just to warm the cheese. Drizzle with the caramel sauce and serve. Ice cream on the side is optional, but recommended! Really interesting! Thanks for sharing that experience. wow, that sounds so delicious! sticky and fabulous! Louise, I added a picture. It’s not the greatest because my ice cream was melting all around it, but you get the idea. The wine they paired it with was called Urban Riesling. When I read the title for today’s recipe, I thought “dessert :-)”. It sounds like it would be a really tasty hors d’oeuvres to go with white wine, without the ice cream, of course. What does the finished item look like? Thanks (as always) for the comment. The sticky toffee cheese was unusual. It almost reminded me of a fudge, but crumblier and less sweet. By the way, the HEB chefs (Debbie and Dundee) at that particular store don’t have blogs, but my friend Amy is also a Cooking Connection chef as well. Her personal blog is What Jew Wanna Eat. Check it out! Sticky toffee cheese – OMG! My first thought was of phyllo-wrapped baked brie with brown sugar & pecans. Your lunch sounds wonderful.